There is no doubt that the world we live in is becoming increasingly technological. From phones that can be unlocked by our fingerprints, to interactive books, to robots that exhibit uncanny human-like qualities. And that’s just the start. Who knows where the world will be in 5, 10 or 20 years’ time. Will cars fly? Will robots take our jobs? While we cannot predict what the future holds, we do know that not everyone is so eager to jump on the technology bandwagon. Take reading for example. Texts that were once solely read on paper are now being read on kindles, tablets, laptops and anything that has a screen and a connection to the internet. However, not everyone is enjoying the advances of technology and in fact, when it comes to reading and absorbing information, it can be argued technological advancements have put us at a disadvantage. As digital texts and technologies become more predominant, it’s true that we acquire new and more mobile ways of reading. Yet are we still reading as attentively and thoroughly? Are our brains responding differently to onscreen text than to words on paper? Let’s look into this further. Since the 1980s and the rise of computer technology, researchers in a variety of fields have been investigating the difference between reading on paper versus reading on screen. Prior to 1992, most studies concluded that people read slower, less accurately and less comprehensively on screens than on paper. However, studies published after the early 1990s have produced some inconsistent results. The majority of studies confirmed earlier conclusions, but some studies also found little significant differences in reading speed or comprehension between paper and screens. According to our recent Fuji Xerox Consumer Insights Survey, 26.7% of office employees prefer reading on paper than on screen. 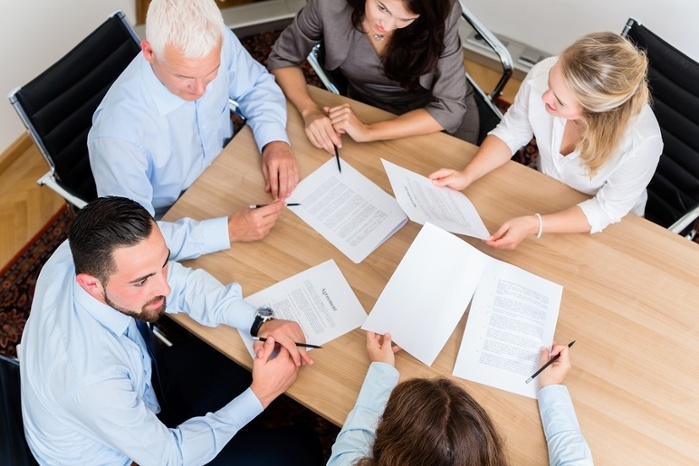 A further 37.6% of employees like to bring a hard copy of documents to meetings. What’s more, a significant 51.7% of people surveyed suggested they like to have a paper trail of documents and keep records. It’s clear that despite the technology available to us, people still prefer a good old hard copy. Yet with all these advancements in technology, and the ability to store and digitise a significant amount of data in one place for easy access, why are we still so intent on relying on paper and physical hard copies? Linguistics professor, Naomi Baron, conducted a survey on reading preferences on over 400 university students across the globe. When asked if they prefer reading from hard copies to smartphones, laptops, kindles and desktops, a significant 92% of respondents suggested that reading from a hard copy allowed them to concentrate better. Print was also suggested to be easier on the eyes and less likely to lead to multitasking. In Baron’s study, 67 percent of respondents said they were likely to multitask while reading digitally (compared with 41 percent when reading print). That’s not to say the respondents did not enjoy reading digitally. Many indicated they enjoyed being able to read in the dark, the ease of finding material and saving paper. Furthermore, a study from Dartmouth University found that while people who used screens for learning helped solidify the details of the learning, paper reading helped readers better understand abstract concepts. The study, while limited by its small 300 participants, highlights how people learn differently when studying data on a screen or a piece of paper. While the science behind whether it is better to read on paper or on a screen is still inconclusive, perhaps when it comes to real life situations, what is important is that we abandon the idea there is only one way of reading, or that technology and the good old piece of paper are embattled in some kind of war. We are fortunate to live in a world where such technology is available to us and maybe we do not need to definitively choose whether we are ‘camp paper’ or ‘camp screen’. There is a time and place for the wonders of modern technology, and a time and place for the humble piece of paper. Perhaps what we can take away from various research and studies into the differences between reading on paper versus reading on a screen is that it’s actually the most beneficial to digest information from many forms. For example, if you want to remember the dates of certain events, a computer screen might allow you to remember them better. Yet if you want to remember why such an event occurred or where, paper would be the better option. So the next time you’re working in the office on a project for an important client or have a meeting to attend, why not consider a twofold approach. Thanks to modern multifunction devices, you can enjoy the benefits of reading on paper, and having digitised data at your fingers tips when you need it. Check out Fuji Xerox Printers’ range of revolutionary multifunction devices here.